Although I love a dark, spicy lamb curry mopped up with garlic and coriander naan bread, sometimes I'm in the mood for something lighter, more mild, and fragrant. 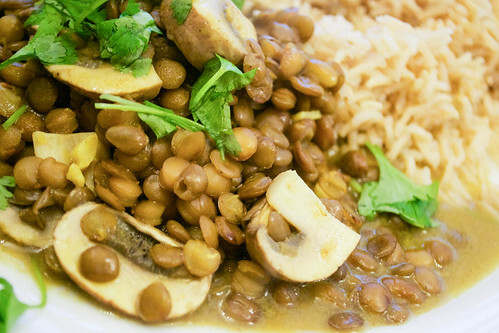 And so one rainy night, this dish was born: lentils and mushrooms in a slightly creamy coconut-based sauce. And it's healthy on many levels. For a start, it's vegan - it's also dairy-free and gluten-free. I love it with a pile of brown Basmati rice. Eating it feels indulgent, but still healthy. Heat the oil in a medium-sized frying pan and cook the garlic until just softened (but not coloured). Add the turmeric, ground cumin and the ground coriander and stir, cooking, until fragrant. Throw in the mushrooms and then drain the lentils and add to the pan. Stir well, and cook for about 5 minutes, until everything is warmed through. Pour in the coconut milk and bring to a simmer. Once everything's hot, stir in the garam masala and season with salt and serve with the coriander leaves scattered over. What are your favourite veggie curries? I've entered this recipe into the Gluten Free Wednesdays Linky hosted by Gluten Free Homemaker. Great to hear, Camilla :) glad you enjoyed it! Oh, that looks delicious! Thanks for sharing it at Gluten-Free Wednesdays. I'll be highlighting your recipe this week.